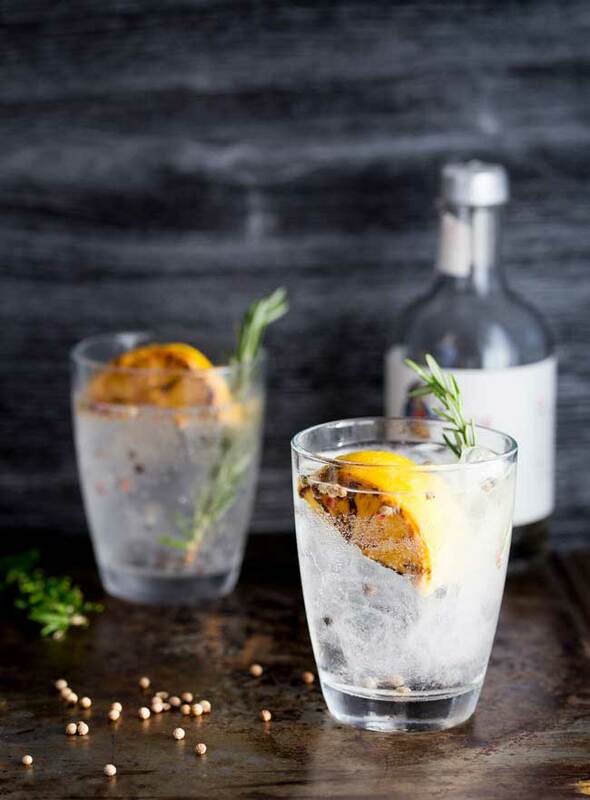 This Charred Lemon, Rosemary and Coriander Gin & Tonic is something special! The flavours are so perfectly balanced and it makes a very beautiful start to the evening/afternoon. Well to any occasion!!! Have one at lunch time I won’t judge just pour me one too!!! You know when I said I was addicted to charred lemons!!! You don’t remember? It is over here in my roasted summer squash post. 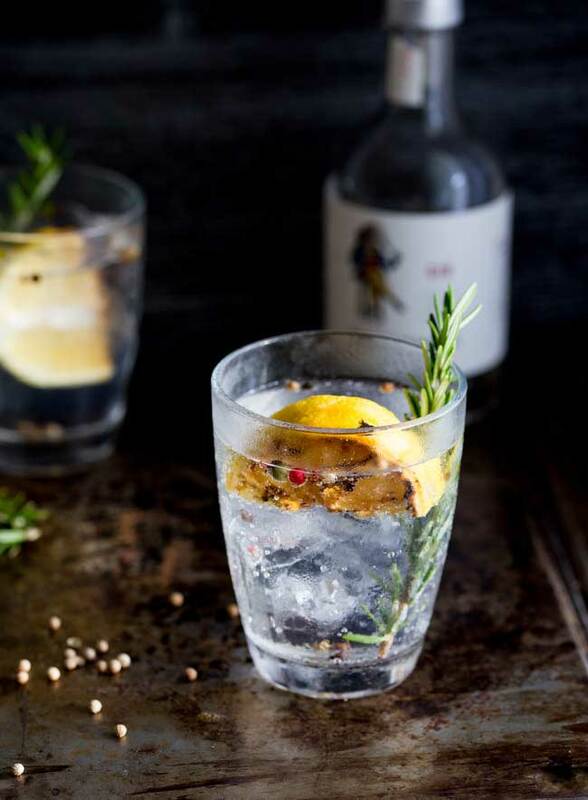 Anyway back to this amazing Charred Lemon, Rosemary and Coriander Gin & Tonic!!!!! 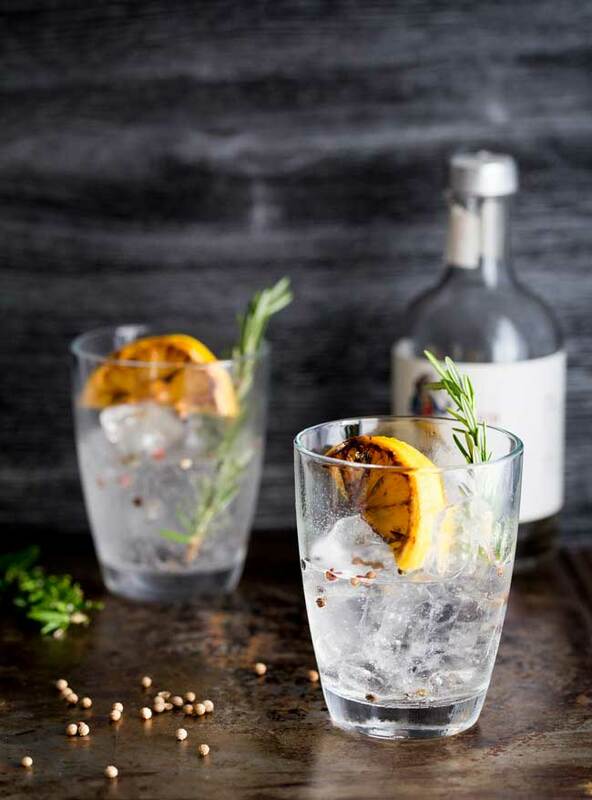 The gin is lightly muddled with fresh rosemary and coriander seeds, which enhances the wonderful botanical flavours in the gin. Did you know that coriander seed has a narcotic effect??? Yup!!! You read that right! Oh man I love those charred lemons!!!!! So we have gin muddled with rosemary and coriander seed. Then we add the charred lemon. The sweet, sour and caramelised flavour of charred lemon!!! Honestly the flavour of lemons that have been blackened is amazing. I cannot say it often enough. If you haven’t charred a lemon yet, get out your cast iron skilled (or heavy non stick fry pan) and get some lemons charring. You will thank me!!! In fact you may cry with gratitude 😉 Yup they really are that good!! 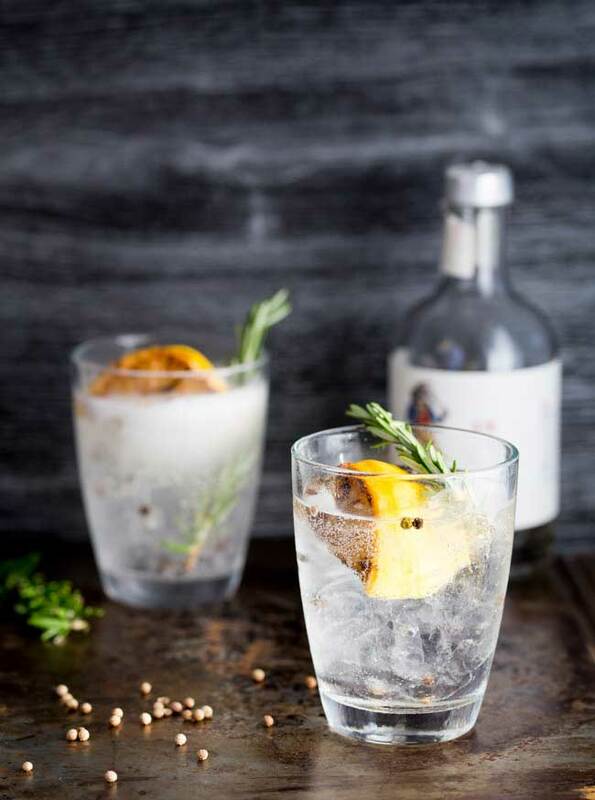 Watch the bubbles fizz in this great herbal take on a classic Gin & Tonic. The choice of tonic water is up to you, there are so many wonderful brands out there. 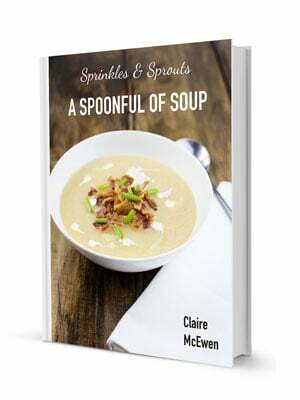 I also should add that I have made this with supermarket own brand diet tonic water and I loved it just as much!!! 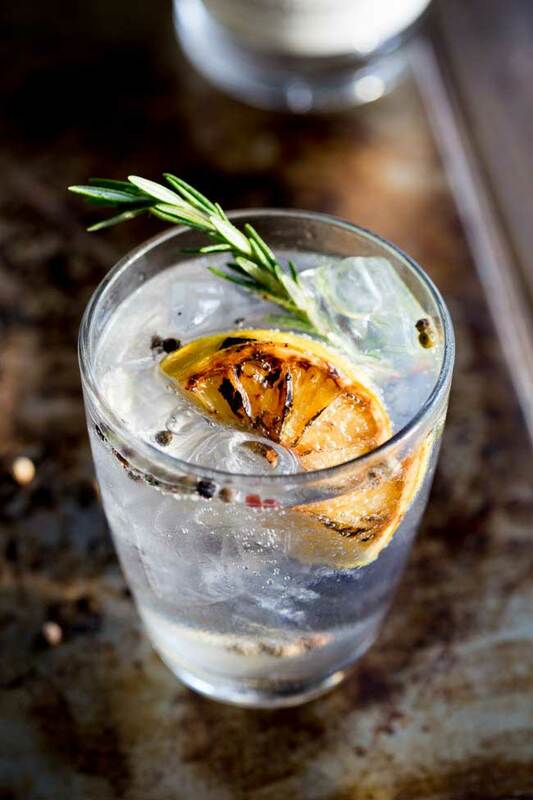 Opps I drank a bit of this Charred Lemon, Rosemary and Coriander Gin & Tonic before I finished shooting!! 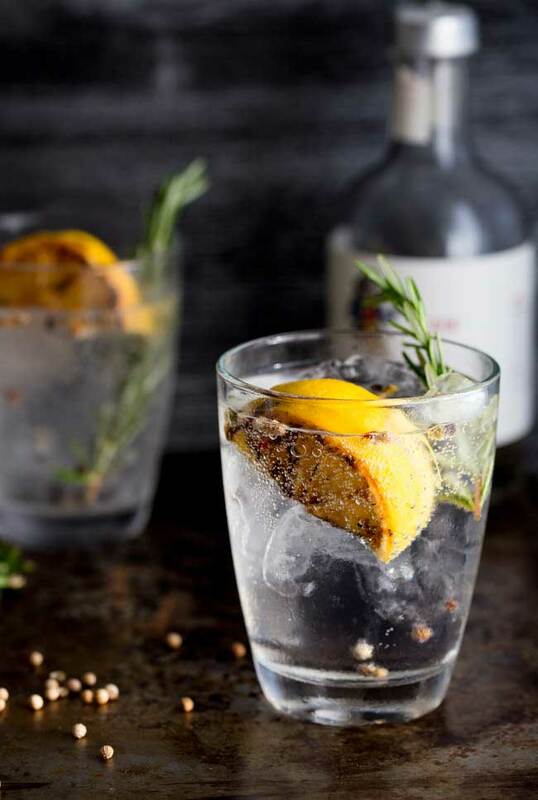 But don’t let the brand of gin or tonic stop you making, open your drinks cupboard find the gin in there and make this Charred Lemon, Rosemary and Coriander Gin & Tonic today. 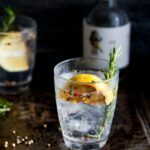 If you love this recipe for Charred Lemon, Rosemary and Coriander Gin & Tonic why not pin it for later. 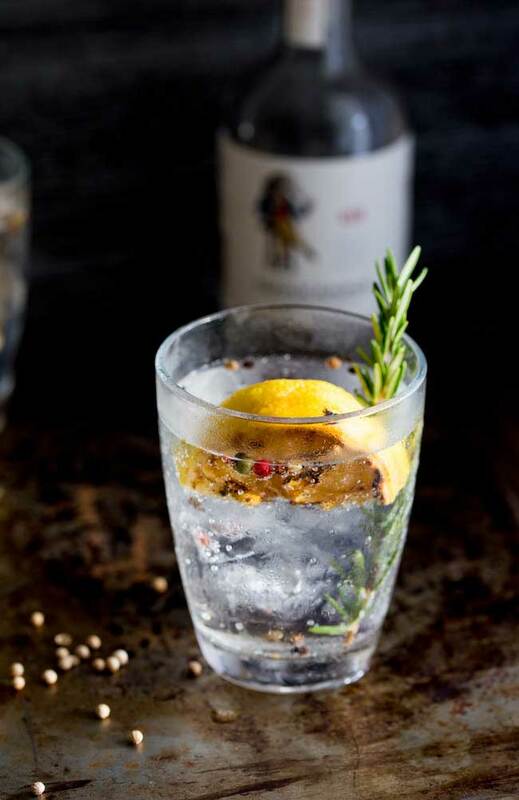 If you love food why not subscribe to my newsletter, I will drop you an email every now and then, just to say hi and send you a couple of recipes think you might love, like this Charred Lemon, Rosemary and Coriander Gin & Tonic. I came across this recipe on Pinterest when searching for coriander seeds. Holy moly! That’s one fantastic cocktail. I’ll give it whirl this weekend and let you know how it comes out for me. It is one of my favourites, I love coriander seeds!!! And I like how pretty the drink is, it always makes me feel happy.